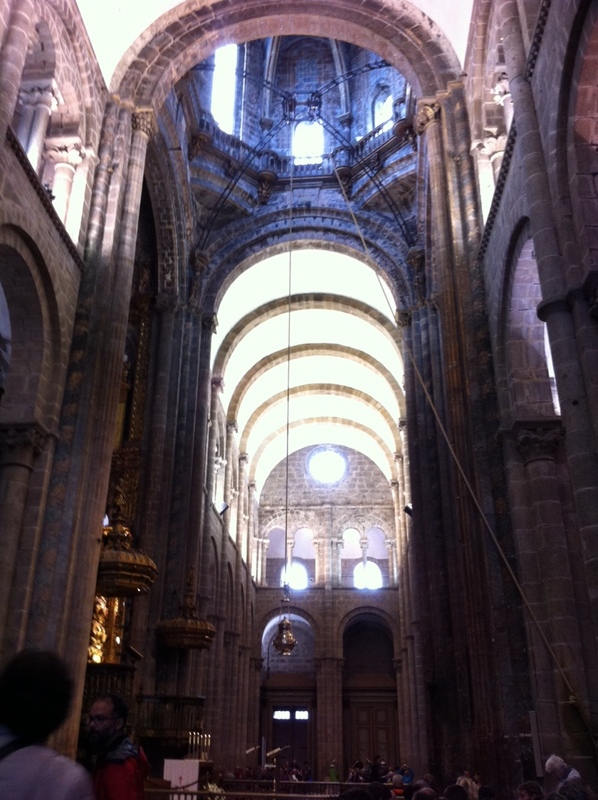 Post Camino thoughts: What a blessing! 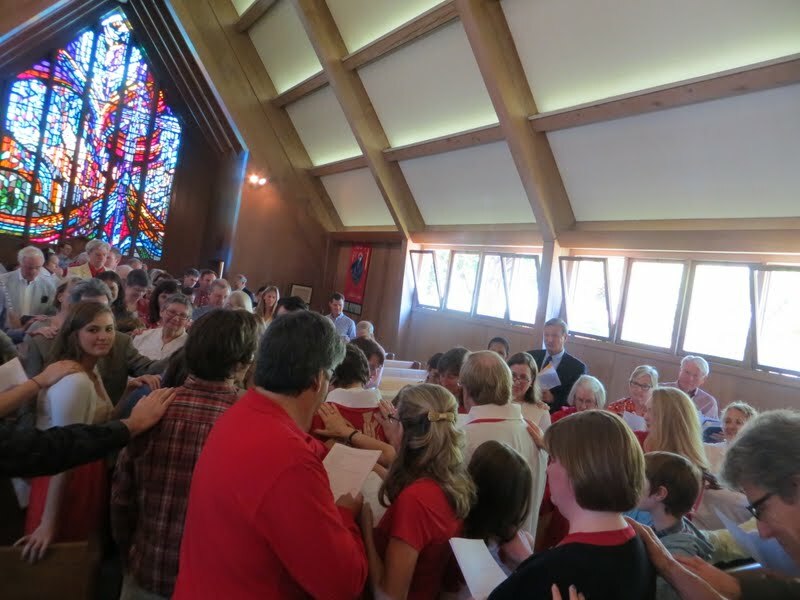 Just over a year ago we celebrated the great feast of Pentecost at Trinity, Menlo Park. 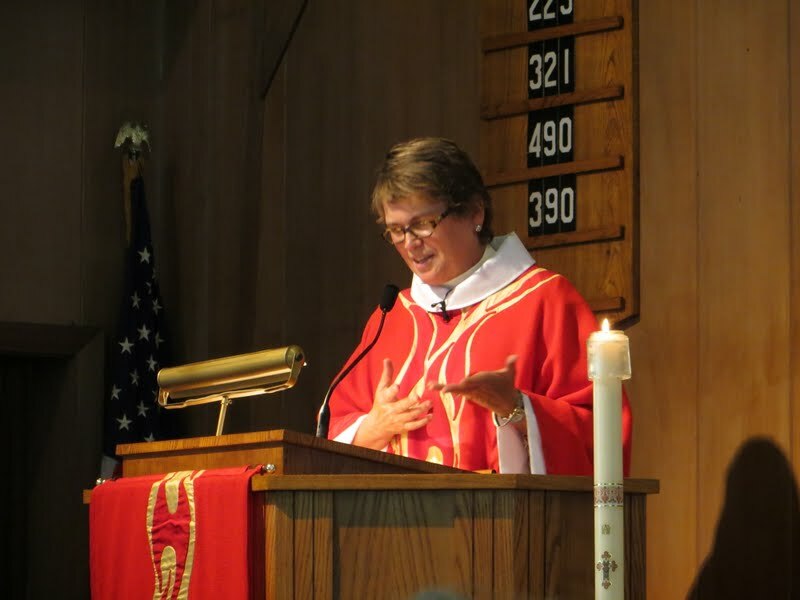 After nearly seven years of serving in the parish, I was moving on, and I was moved by the experience of saying good-bye to a place and community that I loved. 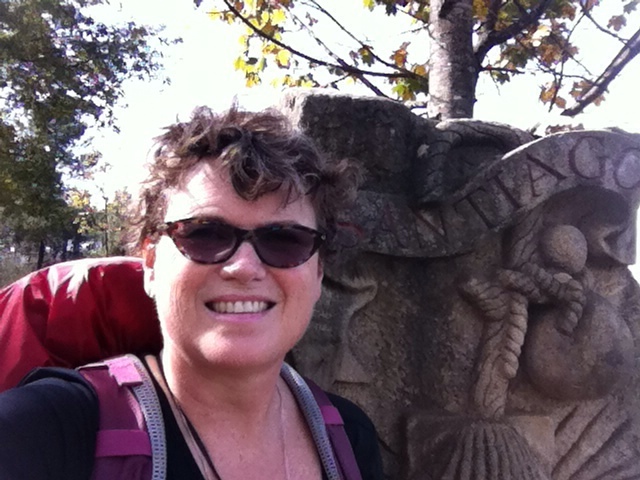 At the same time, I was excited about going on vacation with my husband in France, and making our way to St. Jean Pied-de-Port, the jumping off point for my Pilgrimage on the Camino de Santiago. It was a beautiful leave-taking. O God, who brought your servant Abraham out of the land of the Chaldeans, protecting him in his wanderings, who guided the Hebrew people across the desert, we ask that you watch over your servant Beth, who for the love of your name, walks to Santiago de Compostela. And her strength in her intentions. 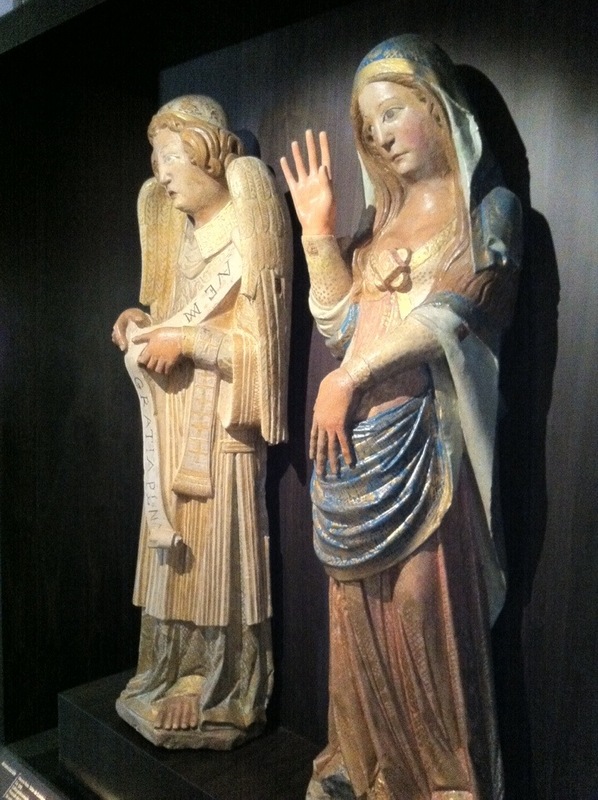 And, enriched with grace and virtue, return safely to her home, filled with joy. 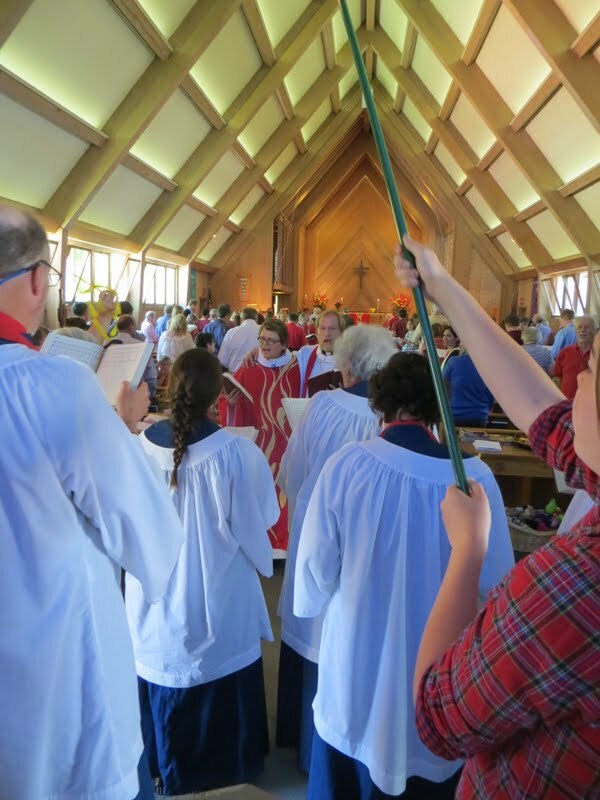 Near the end of the liturgy, the dear people of Trinity encircled me, and the whole community was connected by the laying on of hands as I received the blessing. My heart was full, and overflowing with love. The Holy Spirit was there with us. 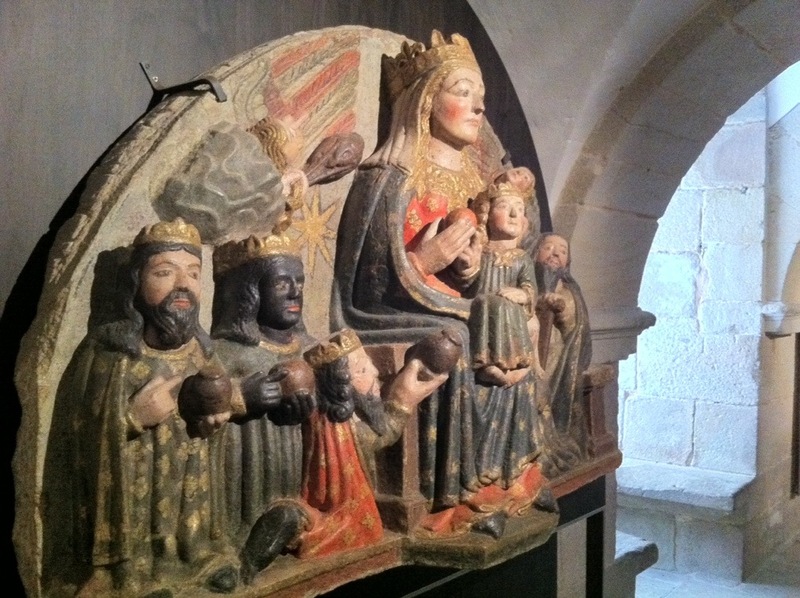 Two weeks later I walked the Camino over the Pyrennes to Roncevalles, the first stop in Spain. I went to the Pilgrim’s Mass at the 13th Century Royal Collegiate Church that night with several hundred of my new best Pilgrim friends from around the world. At the end of the Pilgrim’s Mass, the priest blessed the gathered Pilgrims in Spanish—with the same blessing we’d used at Trinity on my last Sunday! It was my first experience on the Camino of bawling my eyes out because something had touched me so deeply and so unexpectedly. I came to recognize these surprising experiences of joy as Holy Spirit moments. There were more to come. It’s only in retrospect that I can now appreciate the power of that Blessing by the Trinity Community on Pentecost. When I read the Blessing now, a year later, each phrase calls to mind a specific experience on the Camino where I felt God’s presence. It marked a transition in my ministry, and the beginning of my Camino. In that moment, I received the grace and courage to become a Pilgrim, and to walk with a wholehearted sense of purpose: to learn to live into a new sense of joy, and a deeper faith. As we approach Pentecost 2014, I give thanks for my time at Trinity, for my colleagues there, and for all the people of the Trinity community. 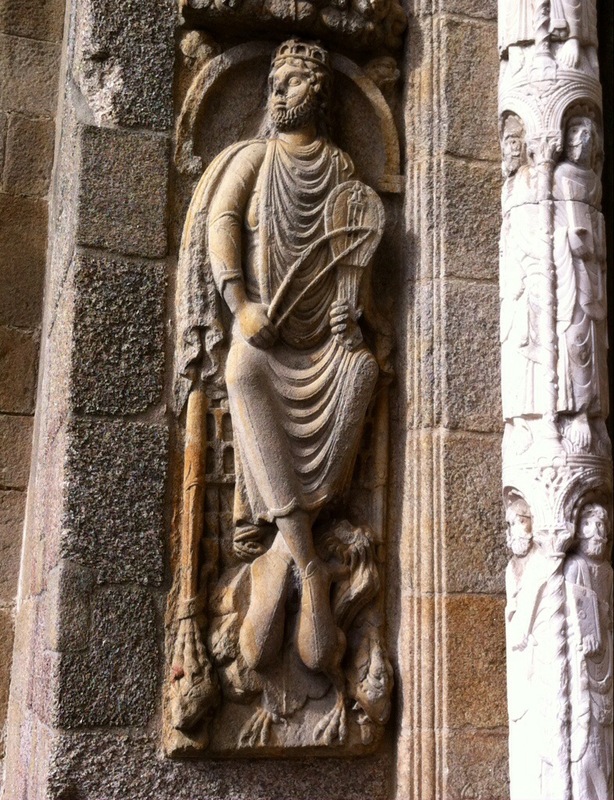 I give thanks for my year of discovery, on the Camino, and afterwards, and for a renewed sense of call. I give thanks, too, for the gift of the Holy Spirit. She continues to blow through our lives with unexpected joys, filling us with her power. She leads us ever onwards, to new experiences, new connections, new life. Six months ago, I flew home from Madrid to San Francisco after finishing the second half of my Camino. 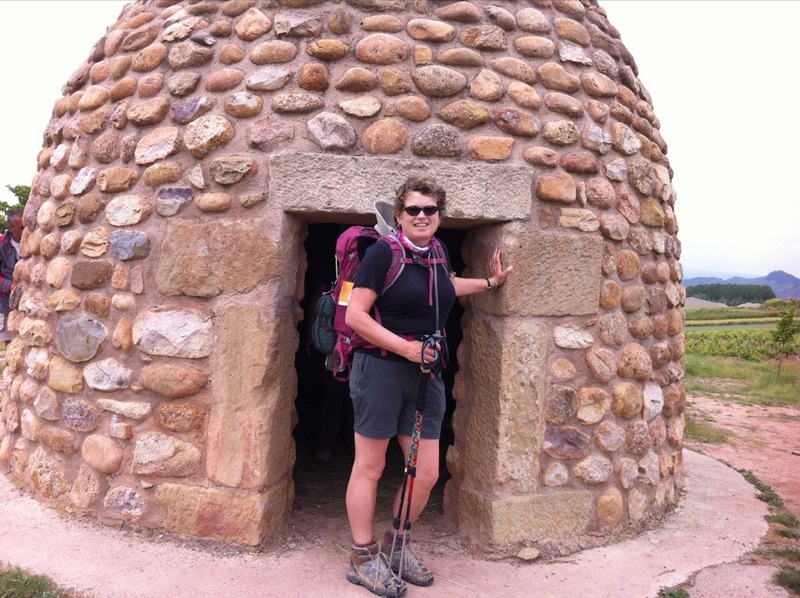 It feels like time to share some of my thoughts about what I learned from walking the Camino. 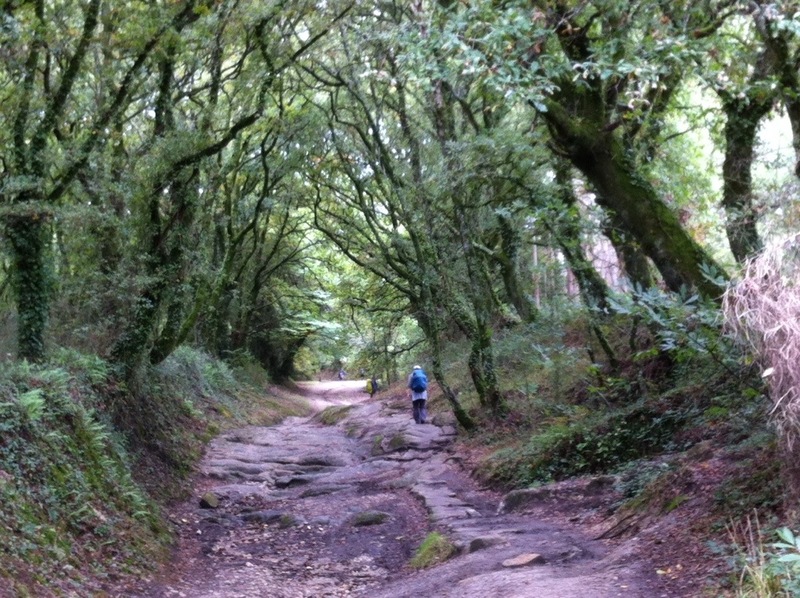 On the Camino you walk places. And keep walking to the next place, and the next. I covered about 10-15 miles a day at about 3 miles per hour. During my years as a commuter, I covered 70 miles a day, often in bumper to bumper traffic, or at 70 mph., but my body was sitting in a padded driver’s seat. 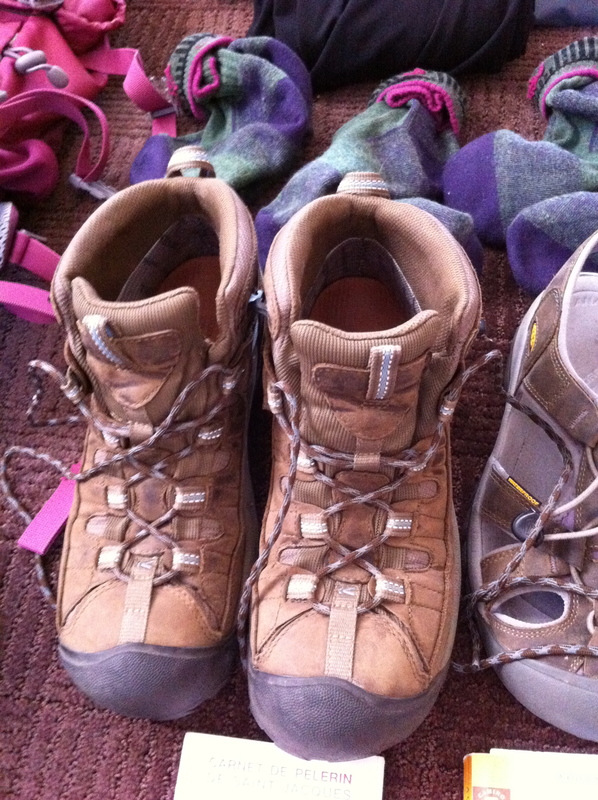 Walking the Camino made me see how much I drove and how bad it was for my body. 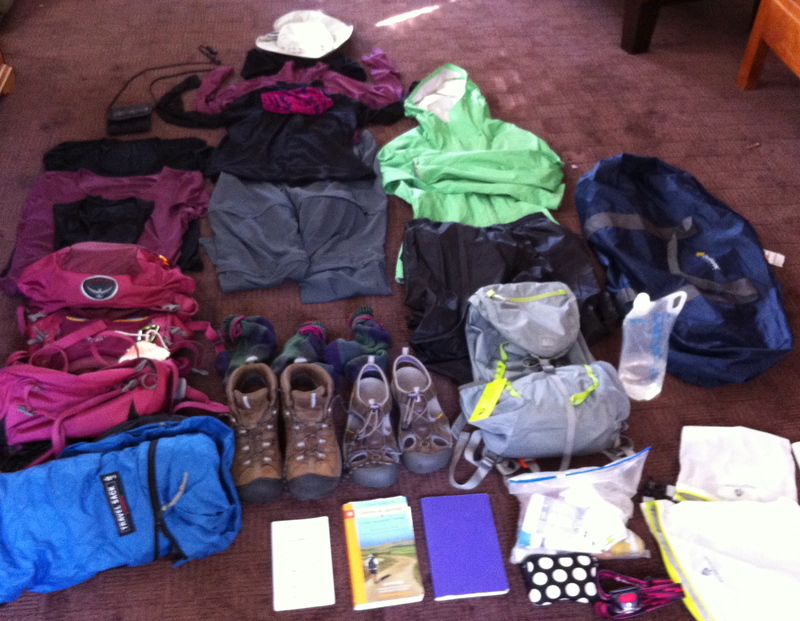 During my first Camino in June my body struggled to move from being a commuter into being a pilgrim. 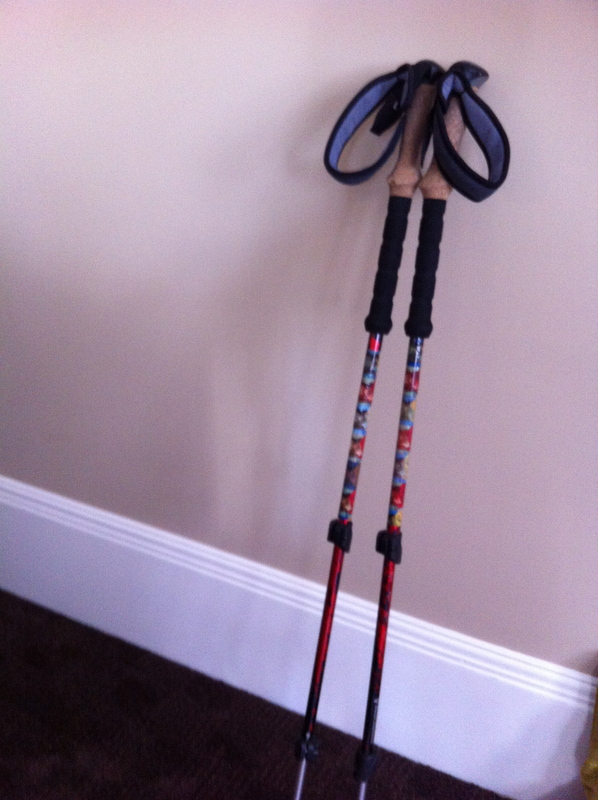 I was not used to that level of movement, and I expected too much out of my body, hence the ankle injury. When I returned in October, my body was more prepared, I took my time, and I began to experience being in my body in a new way. 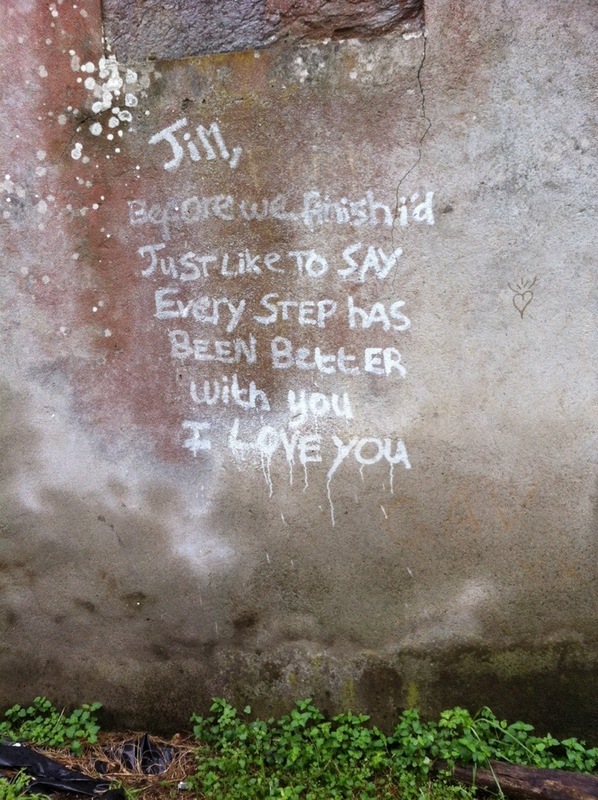 There was unique physical pleasure in walking the Camino. It went beyond the usual pleasures of day hiking, even in the Sierra, the Rockies, or other scenic places where I’d recently hiked. It was pleasurable to realize I was moving myself across the landscape under my own power. It’s a primal thing that we in the 21st Century never experience. I felt a bond with people of earlier centuries for whom walking was the only way to travel. It was pleasurable to feel my body grow stronger day by day. It was pleasurable to start walking slowly in the morning, and then move into a comfortable pace. The walking became meditative. My body was working, and my mind was relaxed. It was pleasurable to feel my physical self, my emotional self, and my intellectual self move into alignment. I learned that my intellectual self is usually in charge, often wrestles with my emotional self, and my physical self usually comes along for the ride. It was a surprise to see what it felt like to do it differently. 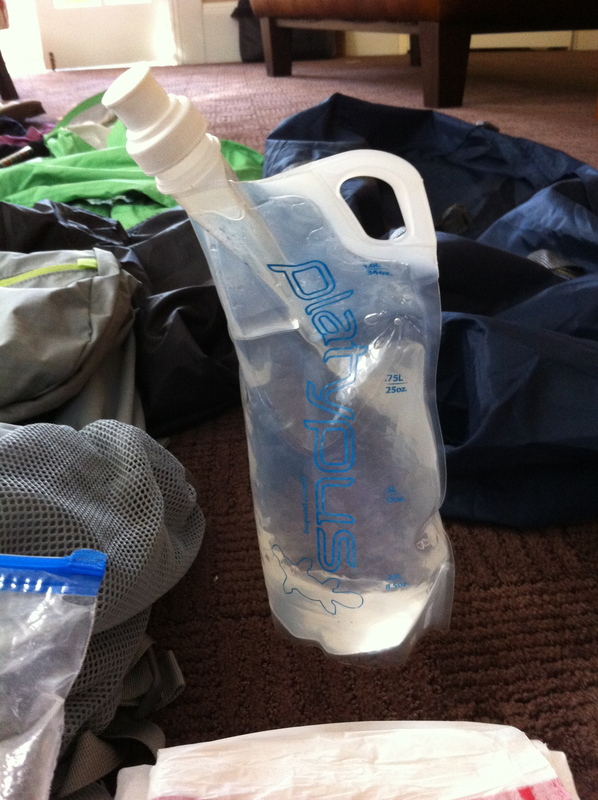 At the end of the day it was pleasurable to feel the sensations of being truly hungry and thirsty. My body was happily challenged, and used. I felt alive in a physical way I’d never experienced before. Walking 3-5 hours a day felt like what my body was built to do. 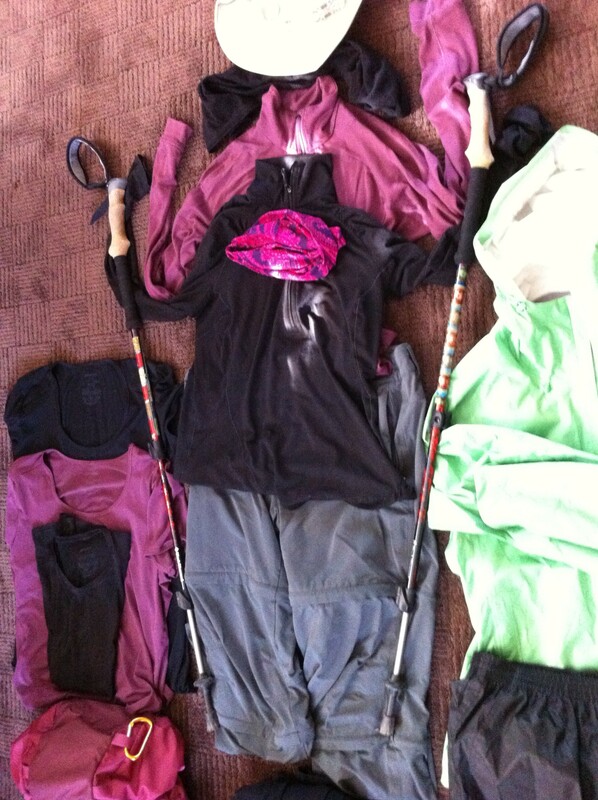 On the Camino, I made friends with my body, instead of using it primarily as my “vehicle” for propelling my “head” around. I lived more in the moment. 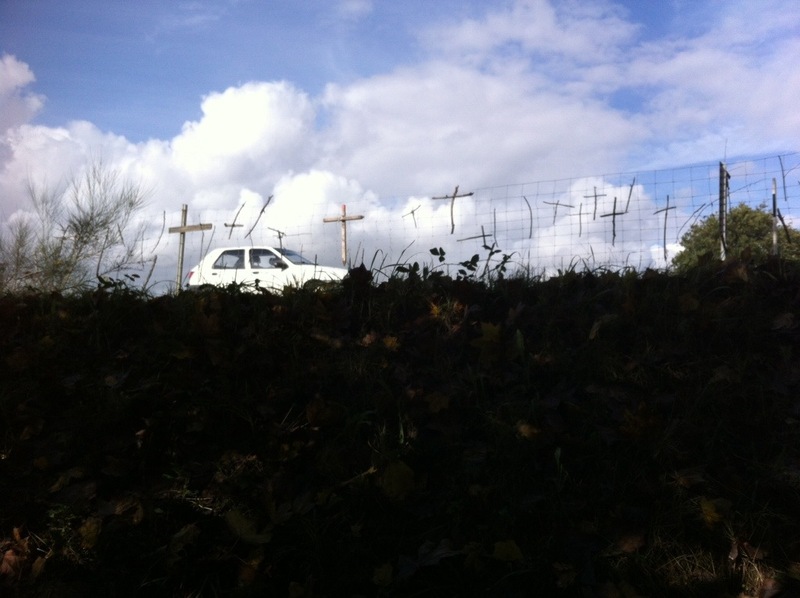 God never felt closer than in those days on the Camino. When I returned home, I was in the best shape I’d ever been in, and I wanted to stay that fit. But it’s not my natural inclination to work-out for the sake of working-out. 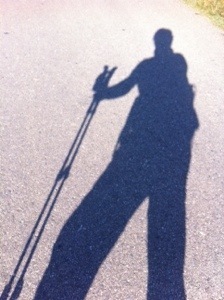 On the Camino, working-out was integrated into the whole journey of discovery. Most of all, I wanted to preserve the feeling of well-being and spirituality that came with it. 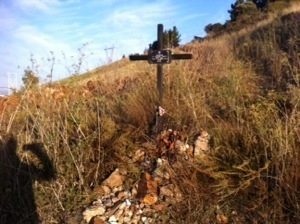 Now I see that walking the Camino was good practice for the rest of my life. When I take a hike, or do yoga, or swim, I feel that now familiar sense of alignment between my physical self, my emotional self, and my intellectual self. It’s more than working out, or building muscle, it’s become a spiritual discipline. In those moments of joy, I feel God is close. I live in a body, and it is good. 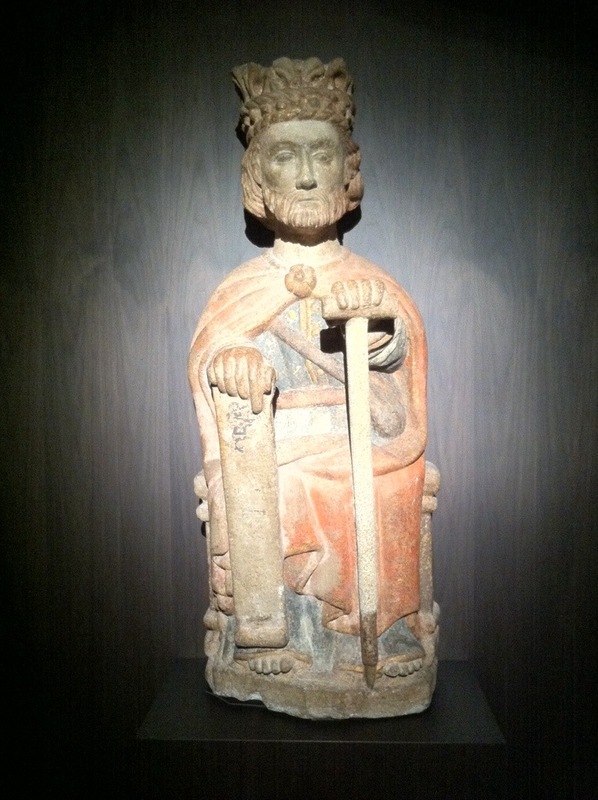 The Museo, and the Cathedral itself have a wealth of Romanesque art from the 11th, 12th, and 13th Centuries. I love this really old style. Friday morning I woke up in my “garret SRO” room and knew I had to move house. 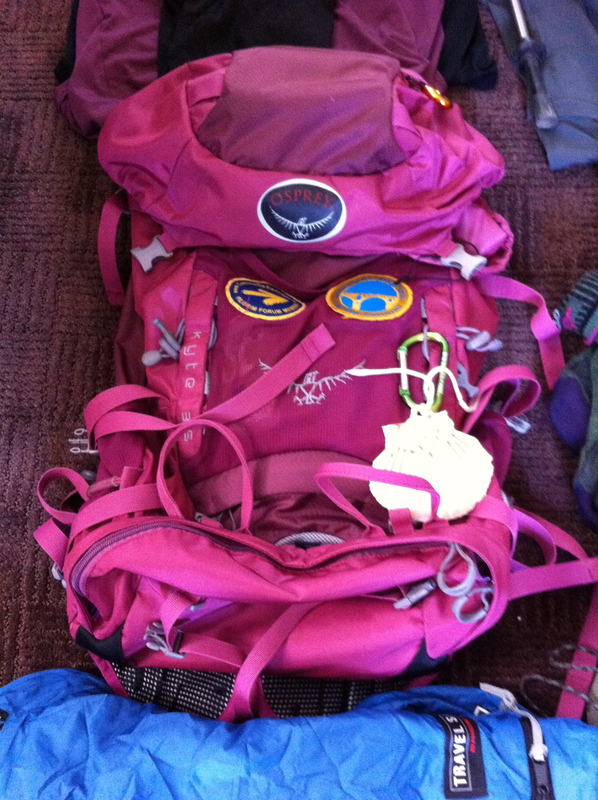 My pack and boots were still sopping wet and they told me at the reception desk that the heat was off until November 1st. OK. I went on Booking.com, then went out in the neighborhood looking for the hotels on the site. I asked a jewelry store owner for directions and she suggested a hotel a little further on. 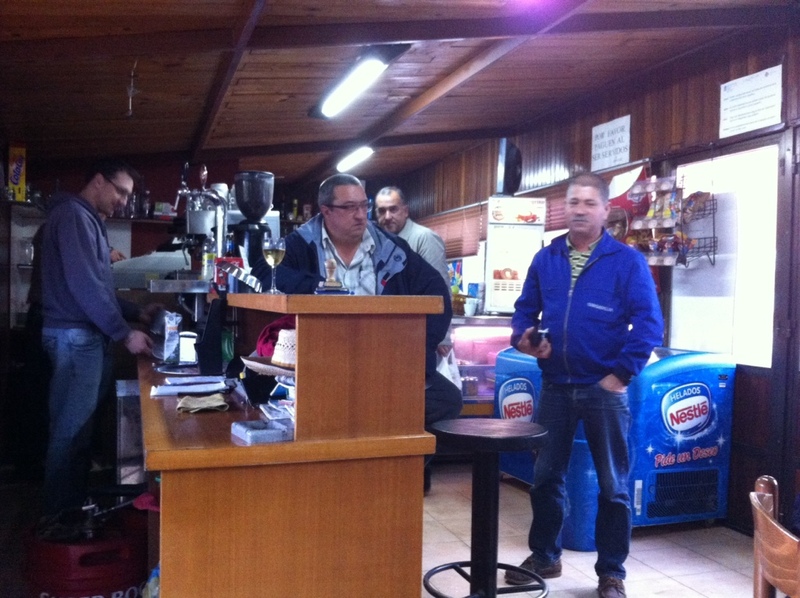 They were super friendly when I arrived, more like my favorite albergues, and they have radiators that are in use! After checking in with all my wet worldly goods, I headed back to the Cathedral where I planned to spend most of the day: the 12:00 mass, (the Butafumiero, the giant incense burner, was scheduled to swing) and then the museum and roof tour. I still felt keyed up. 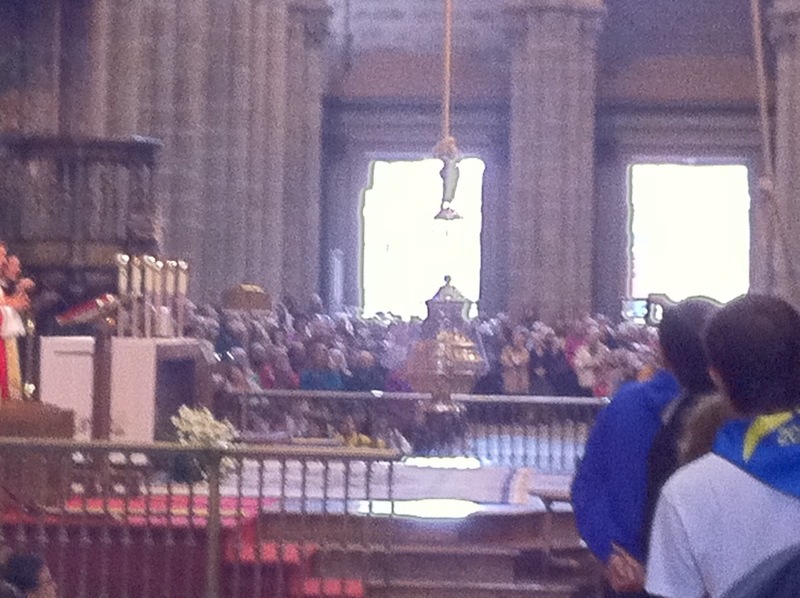 At 11:30 I was fortunate to find a seat on the aisle in the transept, and waited for the 12:00 Pilgrim’s Mass to begin. 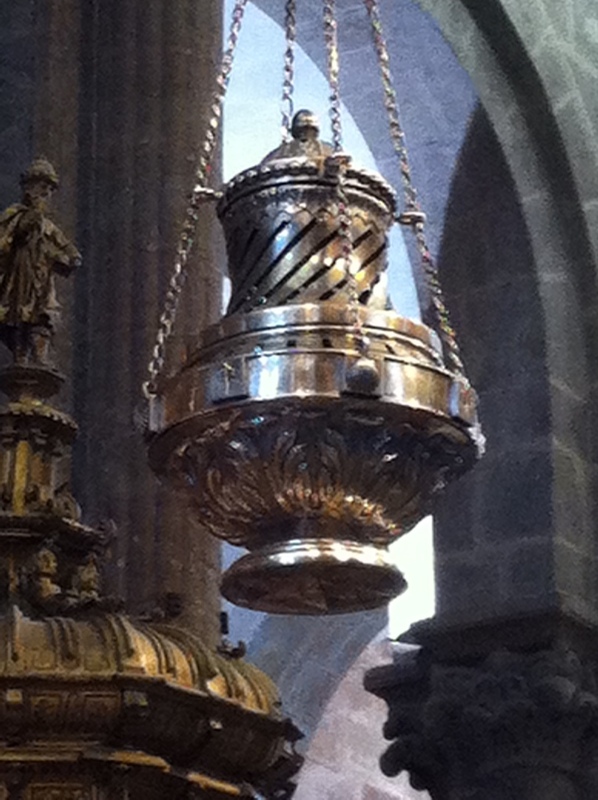 The Butafumiero is a giant incense burner made of silver that hangs from a rope attached to a pulley system above the altar. It takes a crew of men to make the Butafumiero fly. 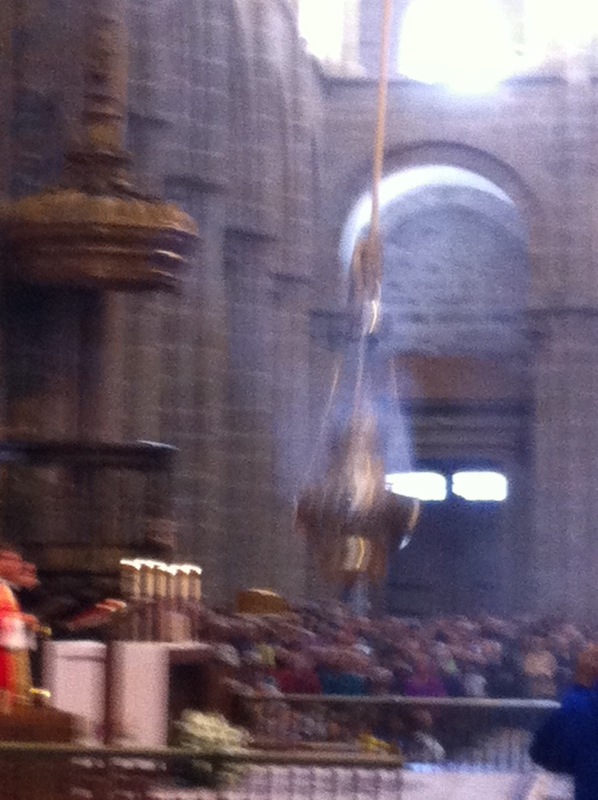 You can see the knot of ropes attached to a pillar at the crossing when it is set up for the Mass. I felt regret that I had not arrived right then, before the Mass, like many people around sitting near me. One of my tasks of the journey is to let go of regrets, and be less hard on myself for things, for not doing things perfectly. I let it go. 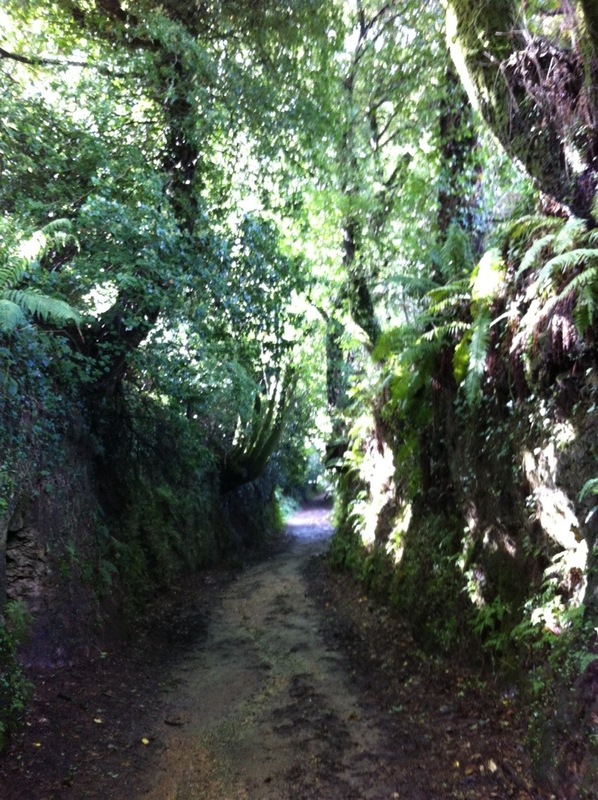 Like the rest of the journey, this was my Camino, with twists and particularity. It was ok.
A nun led us in singing the responses before the Mass began. 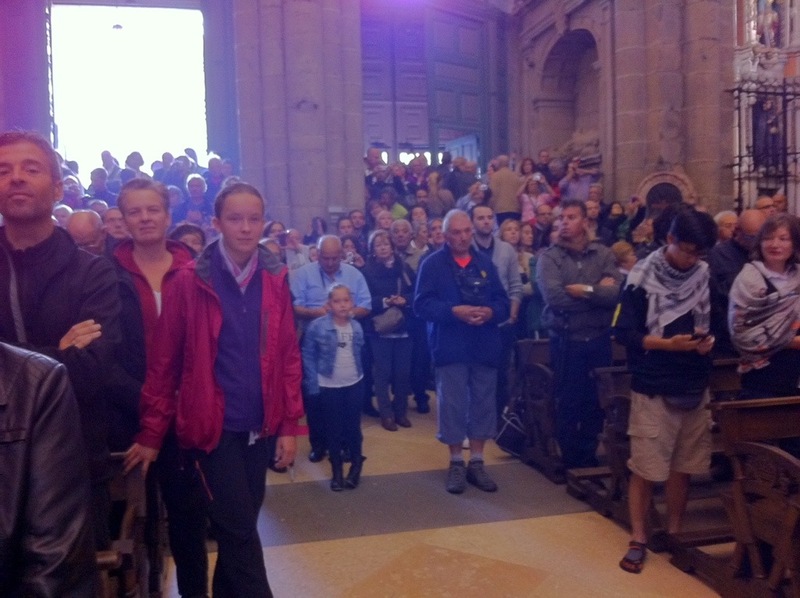 There were announcements in multiple languages for silence, and that NO PHOTOS or MOBILE use during the service. The Mass began, all in Spanish of course, but I found, through familiarity with the liturgy, and perhaps a new comprehension of Spanish that I understood a lot of it. There was a familiar and touching moment when one of the priests moved into place to read the Gospel and he was pulled back by another priest to allow a Deacon to proclaim it. At that moment, I wanted to be with them, at the altar. But I let that thought go, too, because it felt like I was where I was supposed to be, receiving. Then there was a Sermon. A real 20 minute sermon! And I swear I understood most of it. 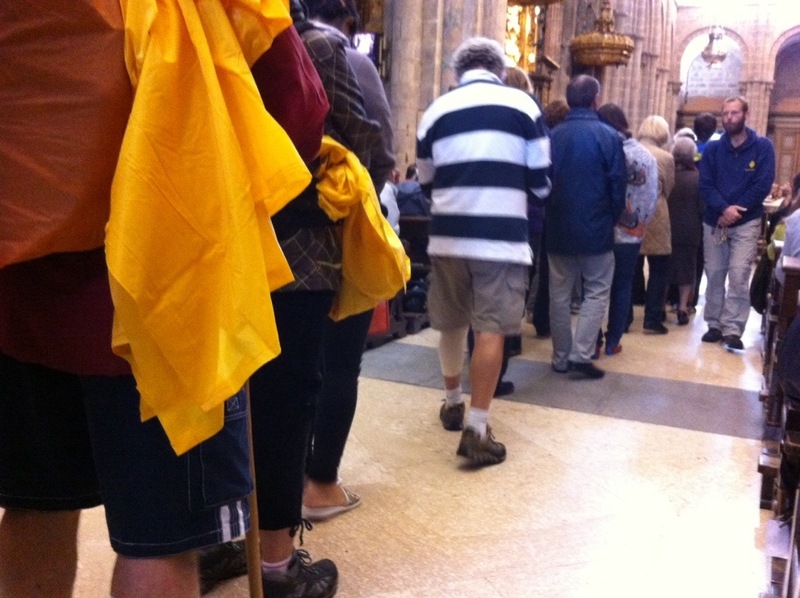 It was about the power of the Camino to transform us into the image of Christ. He is not an idea in our heads we’re supposed to “believe” in, but a person who is there with us. 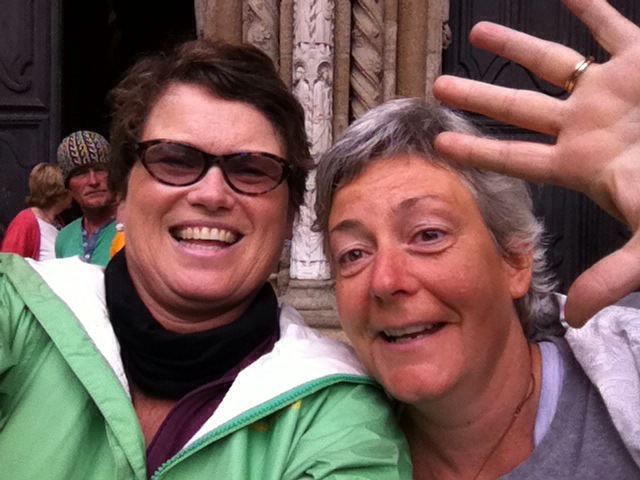 The trials and joys, the friendships of the Camino are a metaphor for life. Through them we can know Christ. 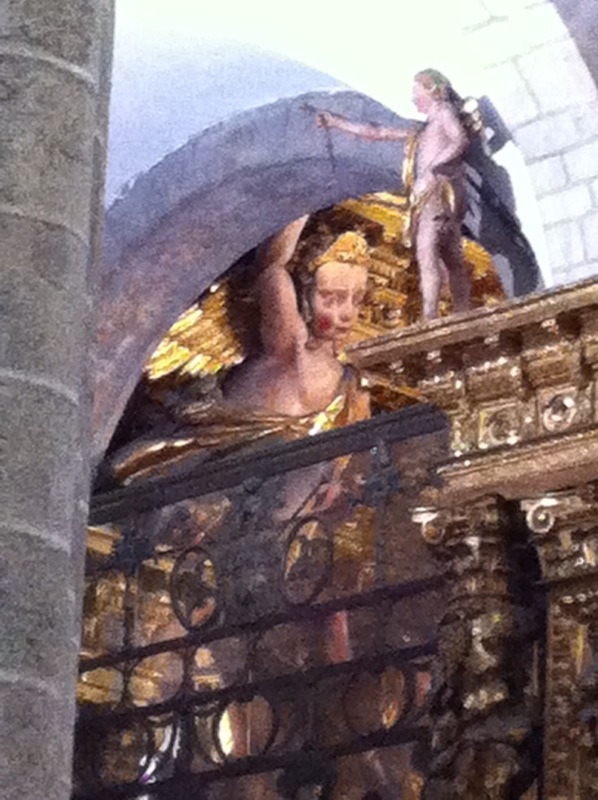 St. James knew Jesus and took the Gospel here to Galicia, and we are called to take the message back into our lives. At the end of your Camino here in Santiago you may take home souvenirs, but the the most important one is being closer to Christ. I looked around and noticed that I saw at least 6 or 7 people I’d walked with. Tears. People in flip flops and sandals with socks. Pilgrims. Were here together in Santiago. More tears. At that moment, I arrived. 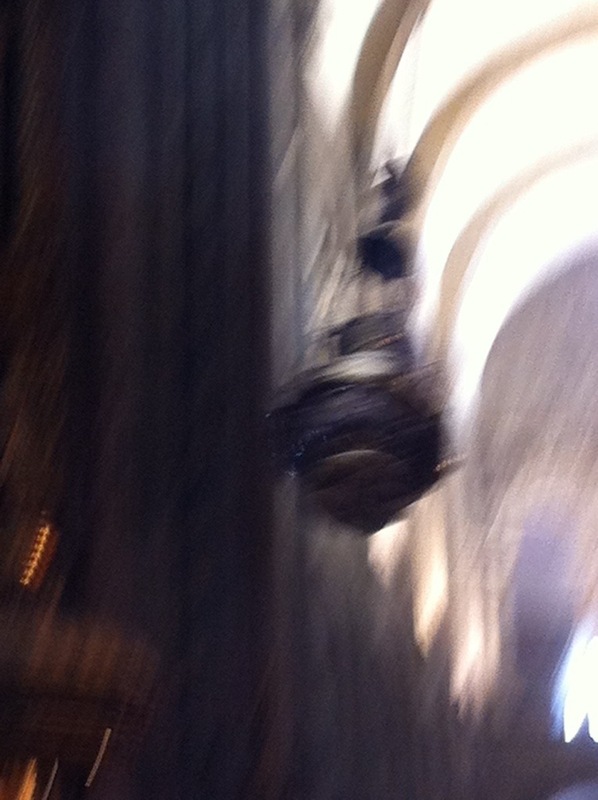 I felt such weepy joy shuffling shoulder to shoulder with the crowds of pilgrims to receive Communion. 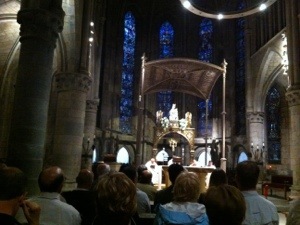 I have never seen a church, let alone a cathedral, so full. It was standing room only. Like an unwashed Easter. 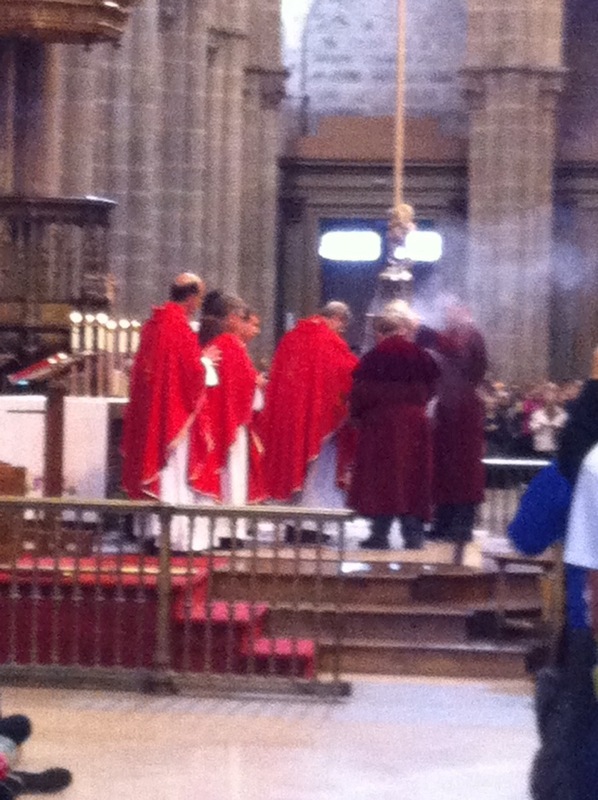 After the Blessing, the Butafumiero crew came out in their maroon cassocks and untied the massive ropes, and it was lowered so the incense and coals could go in. Then the “captain” of the crew signaled for it to go up above his head, he grasped the bottom of it and gave it a mighty swing towards us. 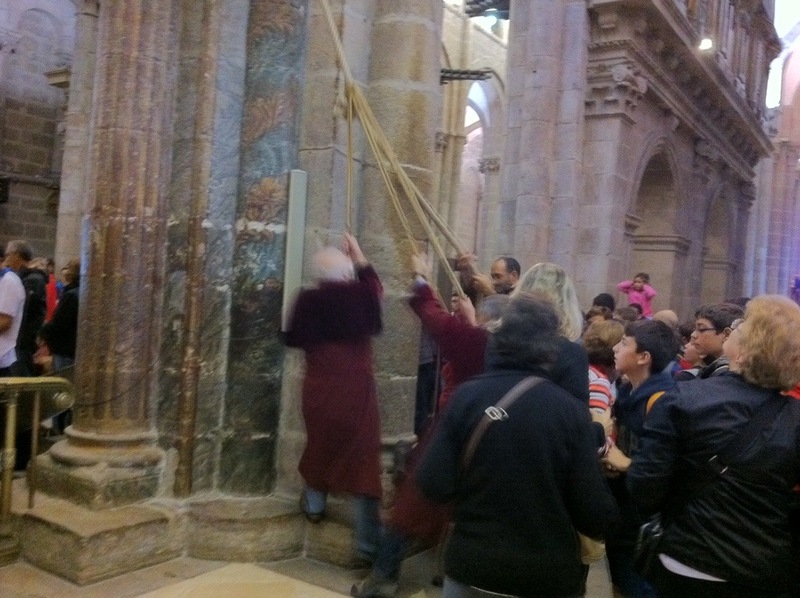 The men yanked the rope down and up, and it began to fly higher and higher over our heads and then back across the other side of the transept. Each time it swung away from us I could see the red hot coals glowing through the slots in its side. It almost touched the ceiling above my head! Joy, pure joy, awe, amazement. So this is why I came. Not to see this spectacle, but to feel this warm opening in my heart, and the Spirit moving among the people, and within me, such love. Of course, the crowd (me, too) whipped out their phones and took photos, but that seemed authentic to our time, as much as the extreme stinkiness (which was the origin of the Burafumiero) of our medieval friends must have been. 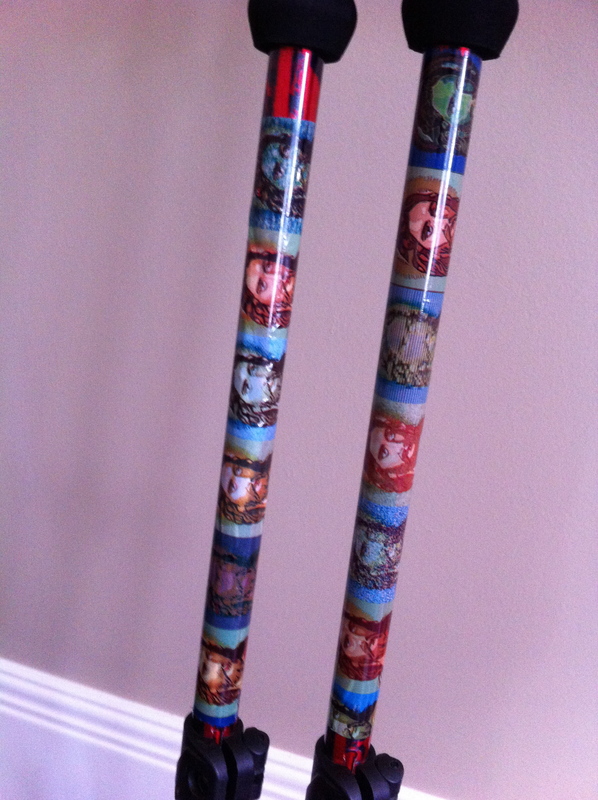 Like them, we’re a little uncouth and worn around the edges. 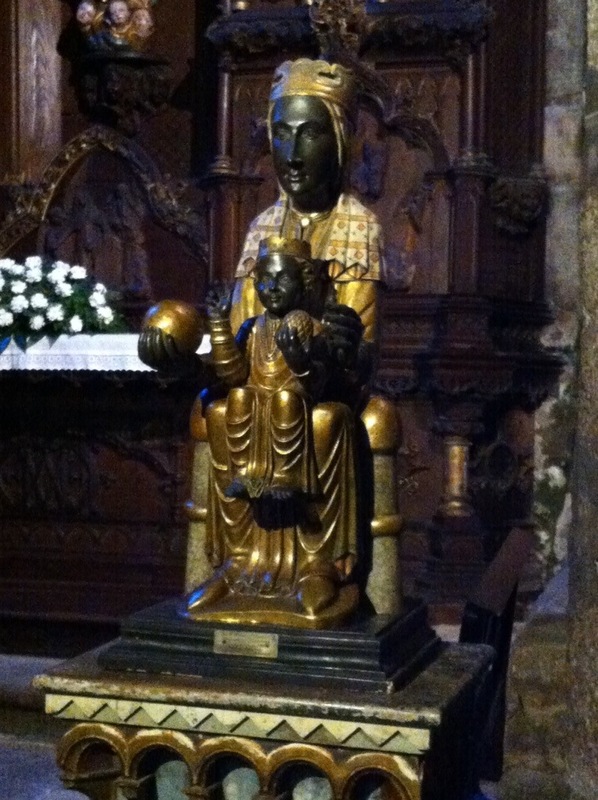 And that’s one of the fruits of the Camino. We’re more real. The Butafumiero took its last pendulum swing and the “captain” caught it, and pivoted around with it on his heel, a fine Spanish flourish, like he was the Matador and the incense burner was the bull. Massive waves of applause! 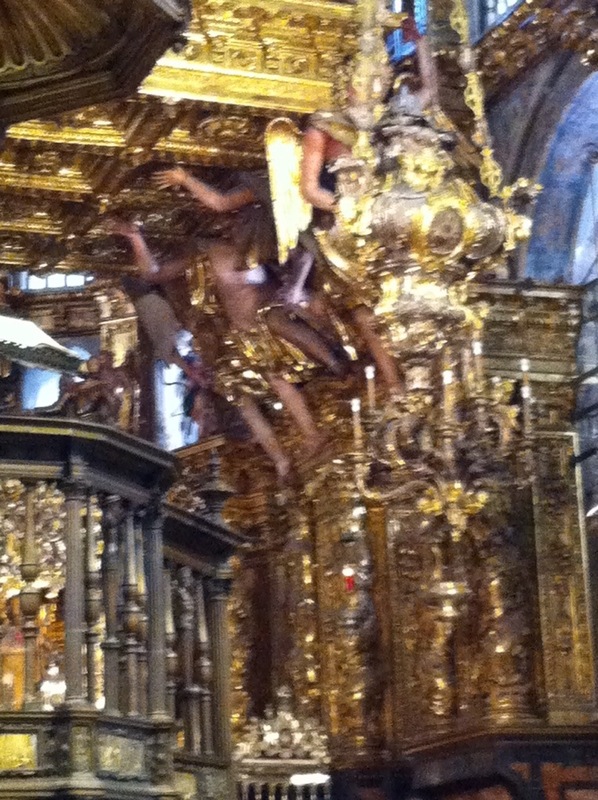 As the baroque organ played, we began to move, waves of people, towards the opposite side door on the Plaza de Quintana. Suddenly I saw Lisa and Harold, from Quebec! Lisa and fell into each other’s arms and sobbed. 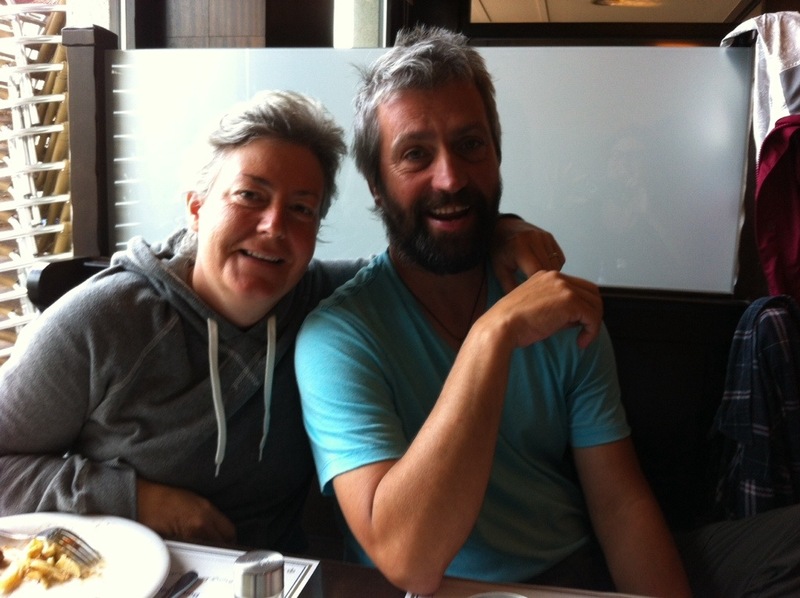 She was someone who I’d talked with for hours on the Camino, very quiet and unassuming, from a tiny town in Quebec. We met Eric and Vi, from Bristol, Linda from Hong Kong, and her Austrian friend, on the Plaza, and found a “free buffet” of 9e for a spontaneous lunch. And there was a salad bar and broccoli! Wednesday night the Casa Rural served dinner at 8:00 and guests, pilgrims all, could barely stay awake, even though we knew that tomorrow was Santiago. I sat with Jonathan and Colin, two brothers in their 60’s. They were from South Africa; Colin has lived in England for decades, and they walked the Camino to reconnect. There were other folks at the table I’d met the night before, a jolly bunch, younger women from Ireland. Everyone revived when the food arrived. There was lots of vino tinto in jugs , but at this point in the journey, I’m now ordering the local, better wine by the glass. Colin is a wine importer and I enjoyed talking Spanish wine with him. The conversation was still flowing at 10:00 when it hit me that tomorrow I’m really arriving in Santiago. I said goodbye, and went back to my room to do the pre-pack. Outside, it continued to rain and rain. At 2:00 I was fully awake. I’d cranked up the radiators to dry my clothes and boots, and the room was stifling. Still raining. I got up and wrote on the blog, trying to unload the torrent of thoughts that was running through my mind. In the morning I took my time, thinking the rain would follow the pattern of the last week and slow at 9:30. No dice. I watched everyone from the night before launch themselves into the rain. 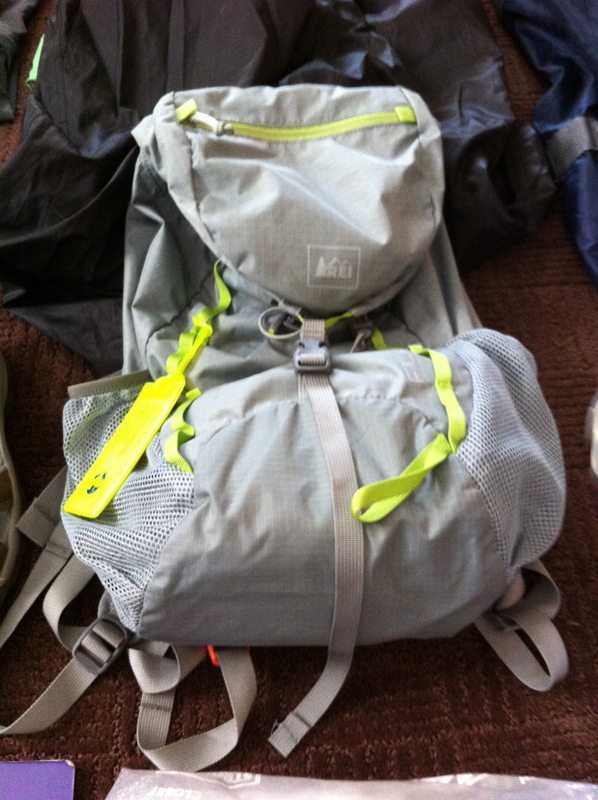 So I took off with the fully-loaded pack. 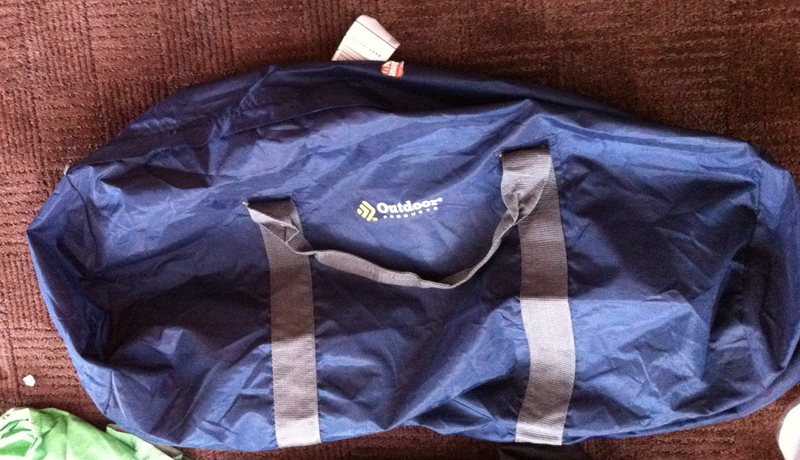 I did a better packing job, and it didn’t feel so heavy. I used one of the Hefty tall kitchen garbage bags that Jean gave me as an extra weather protection between the pack and the rain fly. I walked an hour and stopped at the RV park (!) bar. Inside was a funny scene: about 6 Female German pilgrims seeking shelter sitting at tables, and 3 Spanish male taxi drivers hoping for business. They we’re bring complimentary and charming. But all of the pilgrims were determined to walk the last few kilometers into town, and they were a sorry group. I needed two more stamps for the last day, so got one there and took off again. Pouring. 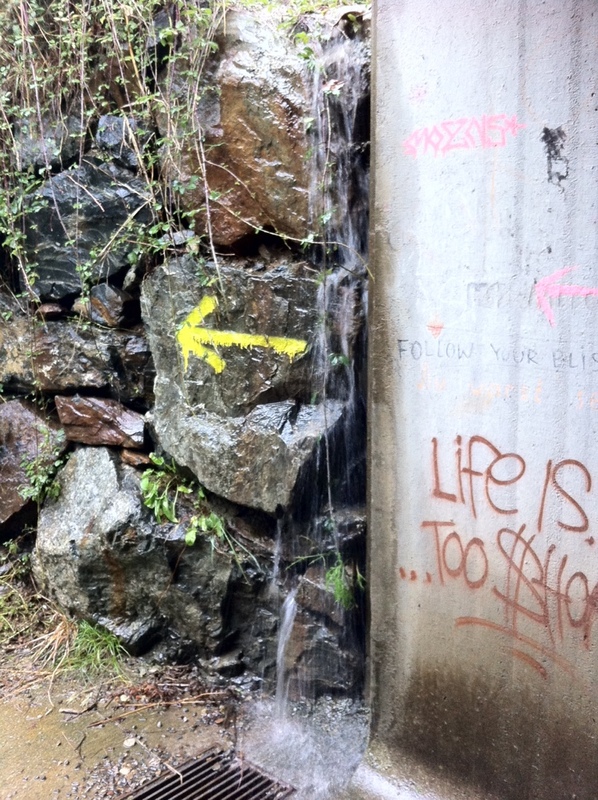 Water everywhere, burbling in streams along the road, streaming down the asphalt, moving, glowing in abundance. I may have received a new theology of baptism walking in the deluge. 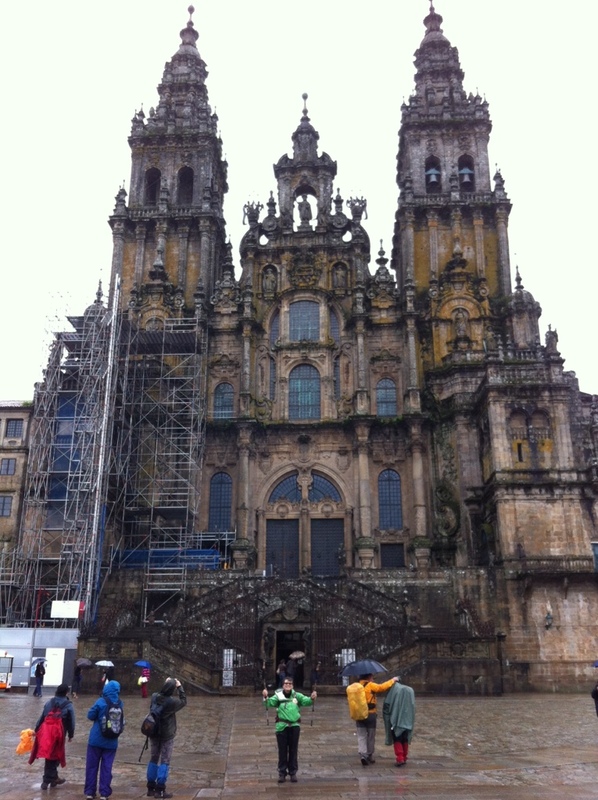 Got to Monte de Goxo, or Mount of Joy, where pilgrims see their first glimpse of the cathedral. No glimpse today. I was getting worried about my iPhone in my pocket. I’d bought a water-resistant Otter Box, but skipped the military grade one. 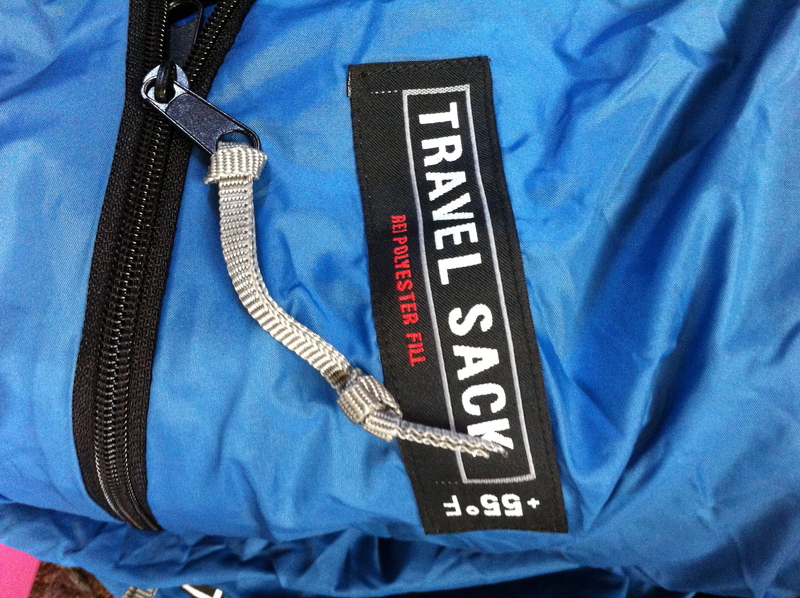 My pocket was getting soaked. Not many photos of my trip into town. 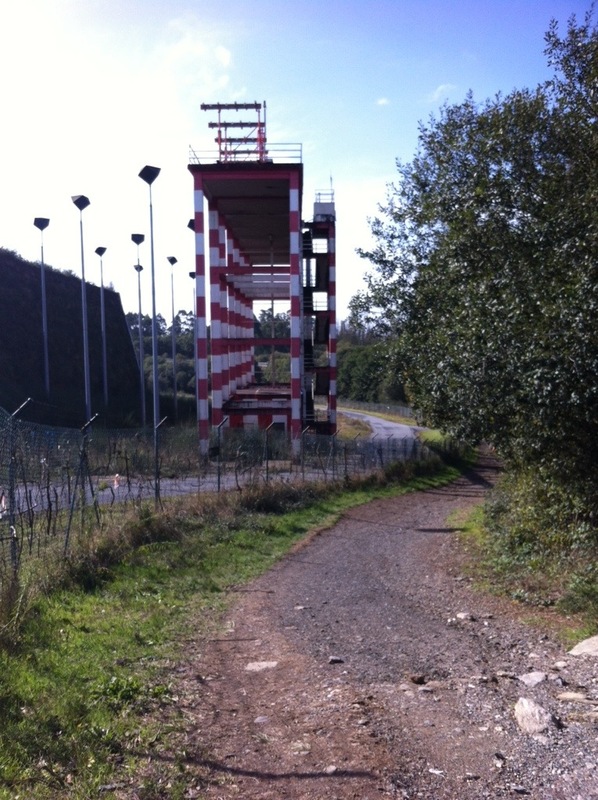 I crossed over a 10 lane Autovia, and train tracks. Said a prayer for those killed in the terrible train crash. 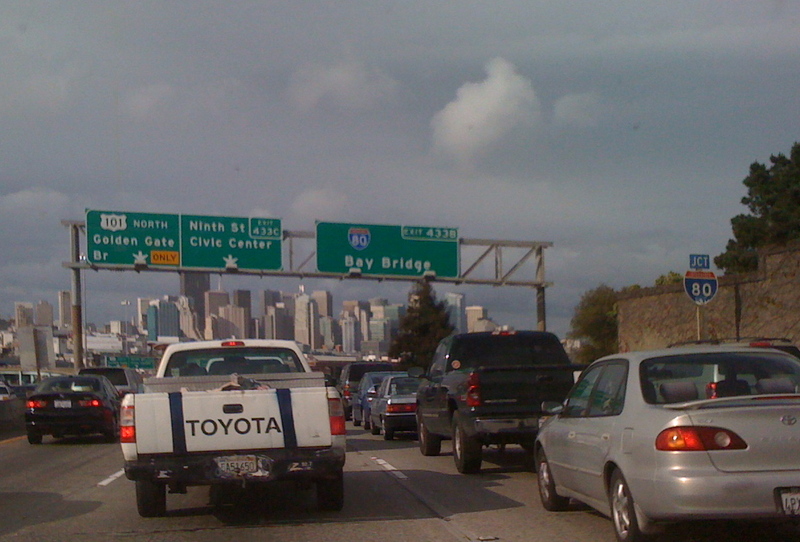 It takes a long time to enter a city in foot. Finally I got to the medieval, human-sized streets. I kept following the shells in the pavement. There weren’t many other pilgrims. Then all of a sudden I heard bagpipes, and saw the side of the Cathedral. 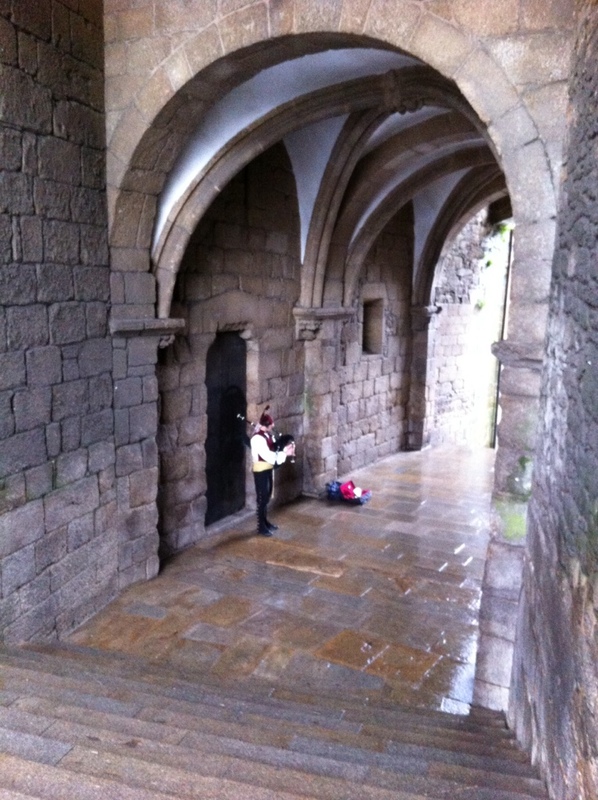 The Camino goes through a charming tunnel, where street musicians play, and spits you out on the grand plaza in front of the Cathedral. I was there! Hard to take a photo in the rain, but one of the German women I’d met earlier took my drenched iPhone a snapped a few. I wandered my way over to the Pilgrim office and presented my credential, and received my Compostella. I felt dazed and all keyed up. I checked into the place I’d reserved, but it didn’t feel right. Too stark and one fluorescent tube light and hard surfaces. It was only when I checked into the nice hotel the next day and went to the pilgrim Mass at 12:00 that I felt like I’d arrived. 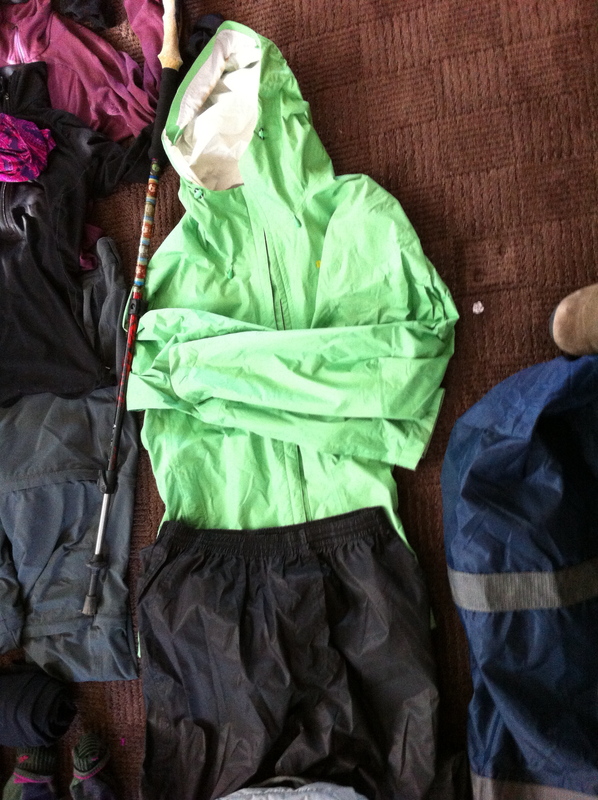 It began like all the other days this week, having coffee before the sun came up at 8:45 and waiting for a break in the rain; setting out, letting the feet and ankles warm up; leaving last night’s stop behind and moving forward towards the next one. I realized once again how I would never go outside on a rainy day like today at home, let alone walk along a busy highway in the rain and then follow a path into dark woods. But now it feels normal and I relish the sense of being out in the elements, and noticing how the weather changes from minute to minute. I have a feeling I may be taking rainy day walks when I get home. Sadly, I would not feel safe walking by myself in the forests of the East Bay hills, which feel so much like these Eucalyptus woods. I haven’t met many Bay Area pilgrims, but yesterday, I met women from Orinda, Redwood City, and San Francisco. Charlene, from the City, lives in the same apartment building as my cousin. We’re going to have dinner in Santiago. Spent a fun couple of hours last night in the Albergue bar visiting with several nice guys from the U.K. and Ireland. One was in his late 60’s and had grown up in Liverpool. He saw the Stones and the Hollies at the Cavern club. 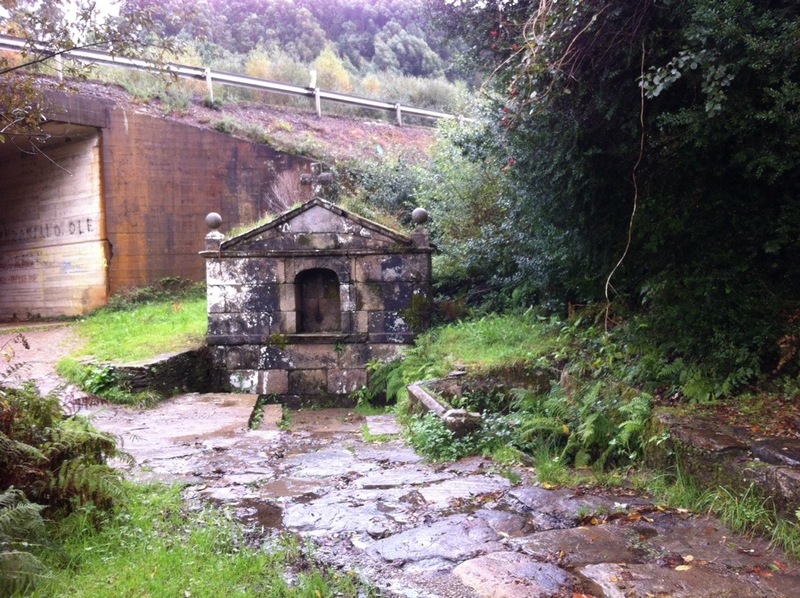 Had fun talking about British Invasion musicians and sharing photos from the Camino. One of the joys of the journey at this point is looking back and talking about specific places on the Way and comparing experiences. Did you stay at Orisson on the first night? What’s your pace been? Did you stay with the nuns in Carrion de Los Condes? I decided to walk 18k today and then have a shorter 8k walk into Santiago tomorrow, and carry the full pack into Santiago instead of transporting the daypack like I have been for the last week. Last night the rain was non-stop, and the gale force winds and rain lashing the stone house kept me awake. 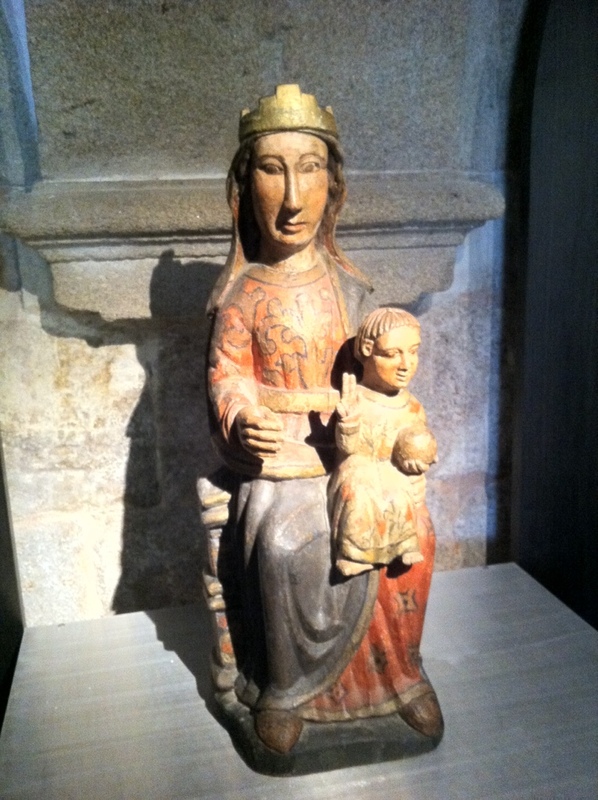 It was my only episode of insomnia on the Camino. I’ve usually been zonked out from all the exercise. My mind was swirling with questions and uncertainties about what I should do after Santiago with my 5 free days before my flight home, and processing the fact that I’m nearing the end of the journey. I will greatly miss the walking, and the combination of the meditative and the physical. I’ll miss the unfolding of the countryside, one village at a time, and so much more that can’t be immediately quantified. 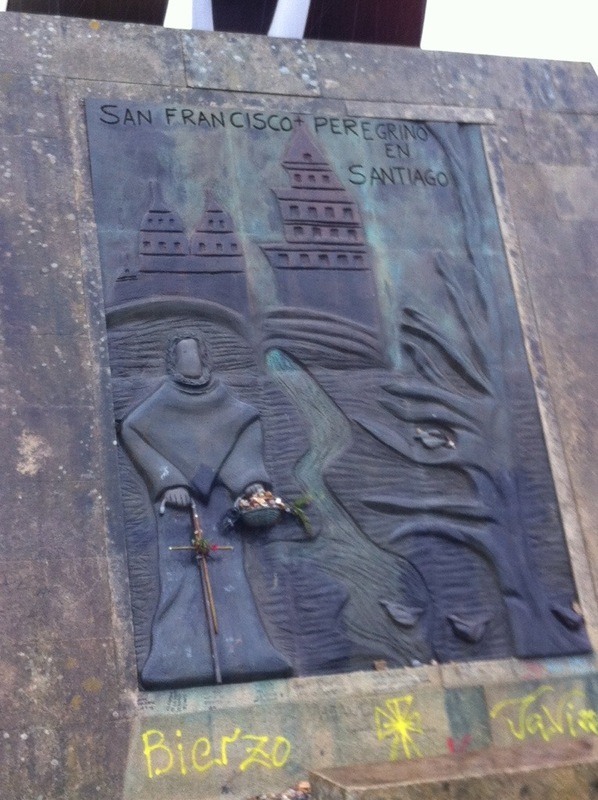 The walk today brought me by the Santiago airport, and into the old suburbs on the hill above the city. Up, down, zigs and zags. I checked into a Casa Rural and met up with some of the same folks as the night before. 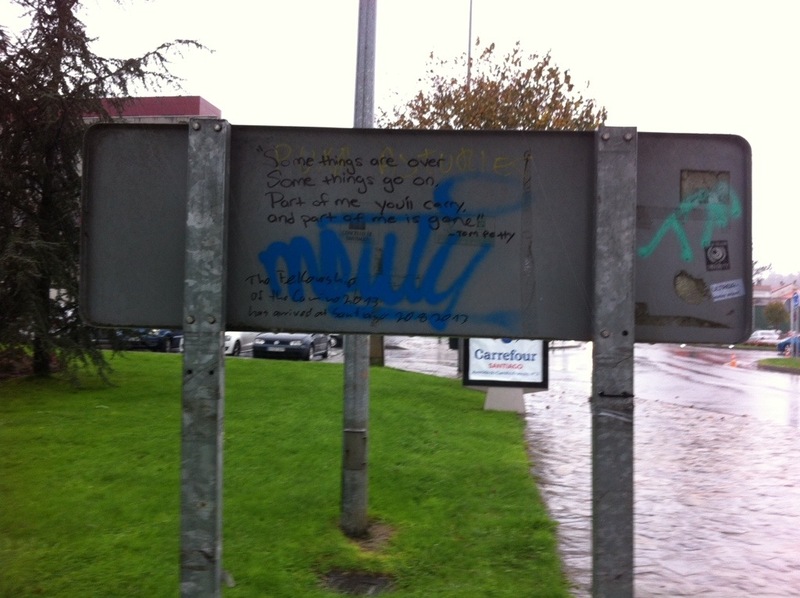 Today, as I walked, I wondered what does Santiago mean to me? I’m sure that was swirling around in the night of insomnia as well. It’s an icon, and like the Emerald City in the Wizard of Oz, it’s glittered out in the distance for a long time. I know I will enjoy it. 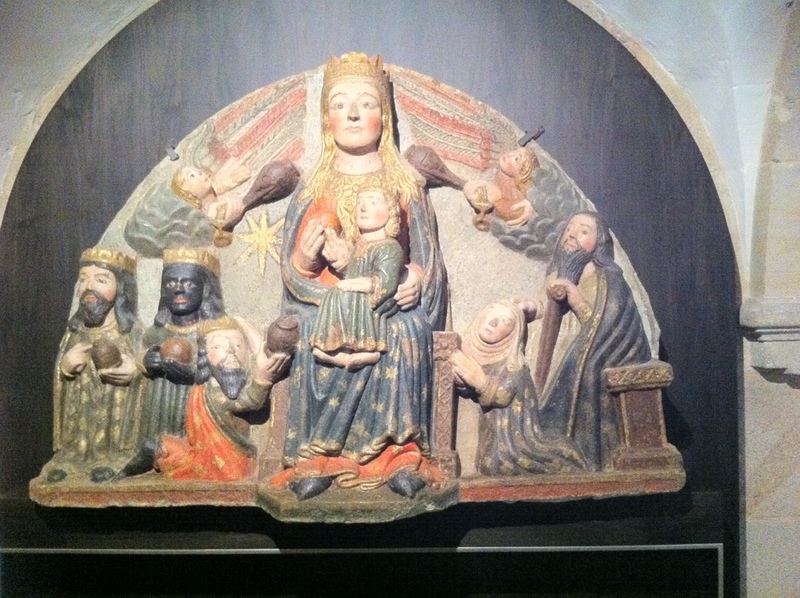 I’ve loved Pamplona, Burgos, and Leon. There’s more to it, of course. 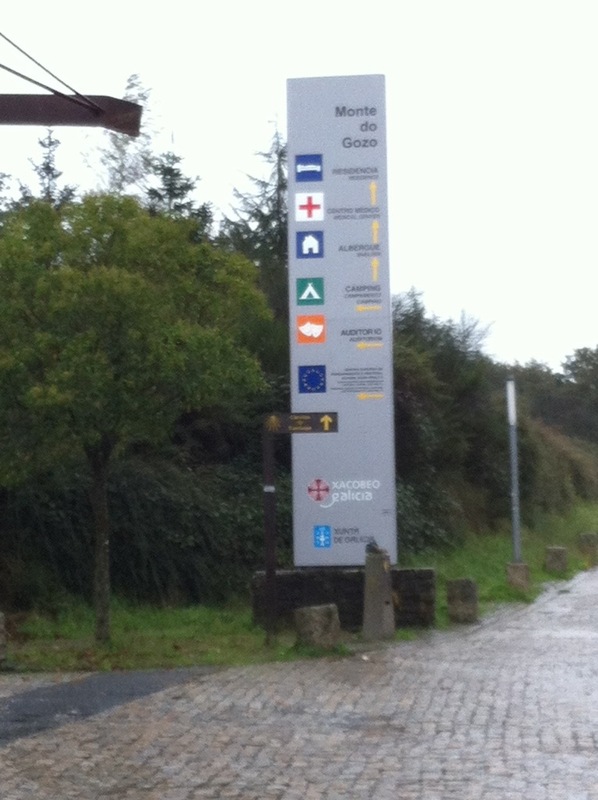 The mileage markers on the Camino have been counting down for days. It’s the end of the pilgrimage. At the heart of what Santiago means to me as a Christian, and from the more Protestant angle, is the tradition that James, one of Jesus’ beloved disciples is buried there. Church history, theology, and faith embedded in the city that I feel drawn to experience. And the sense of being swept along in this river of pilgrims that’s flowed this direction for centuries has been inestimable. Tomorrow I’m going to take my time and savor the experience of swimming in that river of pilgrims. And arriving. As my dear friend, a sailor, commented, it’s a major landfall.